The reason for sql server performance, I found it at the files that are partly failed to installed or left behind there even when you uninstalled the first copy, the integrated security SQL server files still exist on the same server and they are not allowing new installation. So I decided to clean it from scratch, but cleaning is also get failed. Most of the technical people suggest formatting the operating system. And that is exactly what I don't want to do with my Windows operating system. While publishing the page; Top 15 Best Ways To Make Your Computer Run FASTER & More Efficientt; I find the best windows cleaner and try to reinstall and finally I succeeded after lots of troubleshooting. And as I searched and got to know that many of you would have seen this issue when trying to install SQL Server 2008/2008 R2/2010/2012/2014 setup file on the new server, so I decided to share the procedure to save your time. Last time we have seen; how to fix Installation Failure Error Codes 0x80246007, 0x80246008, 800b0100 | Can't Install Microsoft Windows 10 Update, and today we are again going to see something interesting and most critical error for MS SQL installation. Typically, this problem occurs significantly and the solution employs to Microsoft SQL Server Express [SQL Server 2008 R2], Microsoft SQL Server Developer, Microsoft SQL Server Express with Advanced Services, Microsoft SQL Server Enterprise Evaluation, to install SQL database for Microsoft SQL Server Standard, Microsoft SQL Server 2008 R2 Datacenter, Microsoft SQL Server 2008 R2 Developer, SQL Express 2012, Server Management Studio, SQL Server Management Studio Client, Microsoft SQL Server Web, Microsoft SQL Server Workgroup, SQL Management Studio x64, Microsoft SQL Server Developer, Microsoft SQL Server Standard Edition for Large/Small Business, Microsoft SQL Server Enterprise and SQL Management Studio 2012. Learn how to fix and solve the problem in SQL Server installation at Windows. On the Windows operating system, some users like to remove default user rights to the local administrators in order to tighten the integrated security SQL server. And to install Microsoft SQL, they furthermore add the setup account to the local administrator group. And that is why your set up SQL server 2012 management studio or any, the installation or reinstallation process gets failed even if you either upgrading or install SQL database. So to overcome the errors you have to clean your PC for fresh SQL installation. 1. 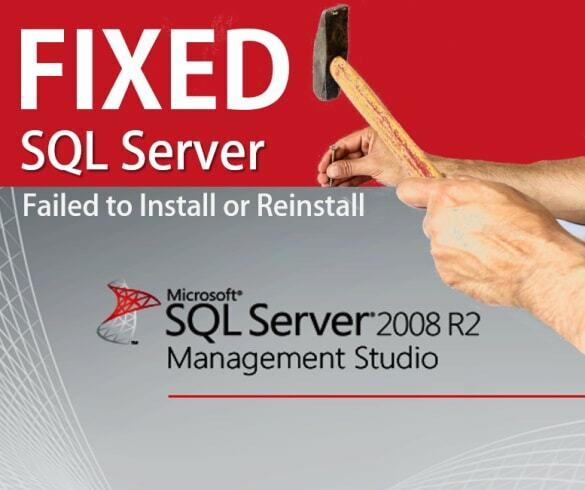 Repair a failed installation of SQL Server. 2. Uninstall SQL Server Express. Also, you need to remove SQL Server 2005 instance components and workstation Components as well. Now go to START >> Control Panel >> Add or Remove Programs >> Microsoft SQL Native Client >> REMOVE. 3. Completely Uninstall SQL server. 4. Remove a broken installation of SQL Server By uninstall tool. Run the installed program, and select 'Microsoft SQL Server 2008 R2' [as per your install SQL database] and click UNINSTALL. Now it will remove all and then it will show the option for POWERFULL SCAN. Click on it and it will show all the registry entries related to the server management studio. Select all and delete. Restart PC. And now check the installation. If you know any other better way to do this and if you think that will help others too then you may share it via comments, we would glad to add it on this page directly.